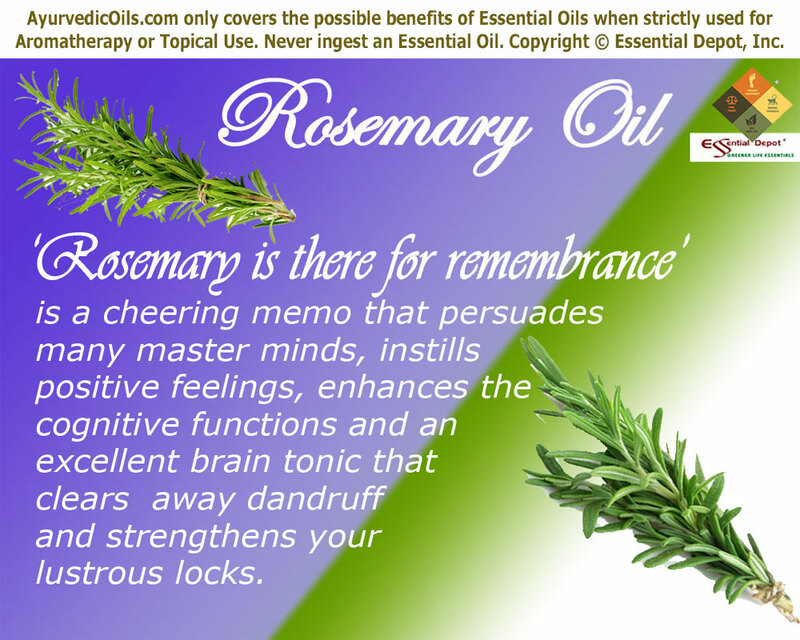 ‘Rosemary is there for remembrance’ is a comforting note that encourages many master minds and for those to be. Fêted for its memory enhancing power and anti-depressant properties, Rosemary herb and its essential oil have been in use for more than thousands of years. The botanical name Rosmarinus Officinalis means ‘dew of the sea’ (ros-dew and marinus-sea). It has been a part of the Ayurvedic regimen and certain other Complementary medicinal practices for its incredible medicinal benefits and its culinary uses. “Helps a weak memory and quickens the senses. The chymical [essential] oil drawn from the leaves and flowers, is a sovereign help…touch the temples and nostrils with two or three drops” said English Herbalist Nicholas Culpeper about Rosemary. The healing values of Rosemary are evident through its use in various medicinal systems ranging from the Stone Age to this contemporary epoch. Ayurveda, the oldest of all healing sciences makes use of Rosemary essential oil for improving memory power and thinking skills. Halitosis, stomach upset, headaches, insect bites and stings were also treated with this oil. The Traditional Chinese Medicine used Rosemary oil to treat baldness and headache. 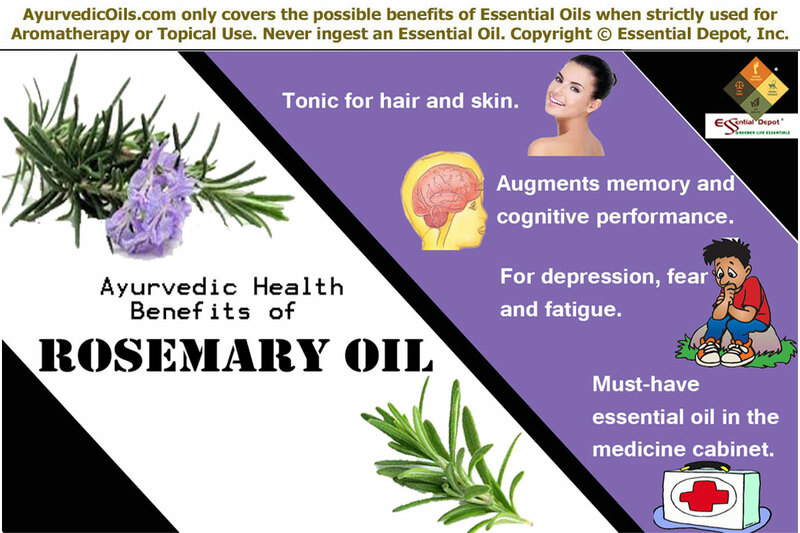 Rosemary essential oil was used as a proven remedy for jaundice in the 13th century and was used in the preparation of Queen of Hungary water for healing the 72 years old Queen’s rheumatism and helped her regain her beauty. The antiseptic and antibacterial properties of this oil made its use compelling in the ancient African medicinal system for handling skin problems like allergies, eczema, wounds, burns and other skin infections. Muscular pain, joint problems, spasms, convulsions, flatulence and bloating were also treated with Rosemary herb and its essential oil. The Roman students wore Rosemary garlands while studying and at the time of their examinations to help them remember without any difficulties. The results of an ethno pharmacological study evidenced the traditional use of Rosemary in Morocco for dealing with diabetes, gastrointestinal problems and hypertension. The dried herb has been used in poultice as an effective post-circumcision remedy along with olive oil in Tunisia. Relished as a natural flavoring agent in a variety of Mediterranean cuisines, the fresh and dried leaves of Rosemary herb is a known natural medicine in the European countries. These leaves have also been approved by Germany’s Commission E for treating dyspepsia and the essential oil extracted from this herb for handling poor blood circulation and joint problems. The most popular use of Rosemary essential oil is its advent in the field of clinical aromatherapy, as a part of the Western herbal medicine to address emotional conditions, improve attentiveness, reduce wrinkles naturally, promote skin health and support a healthy lifestyle. 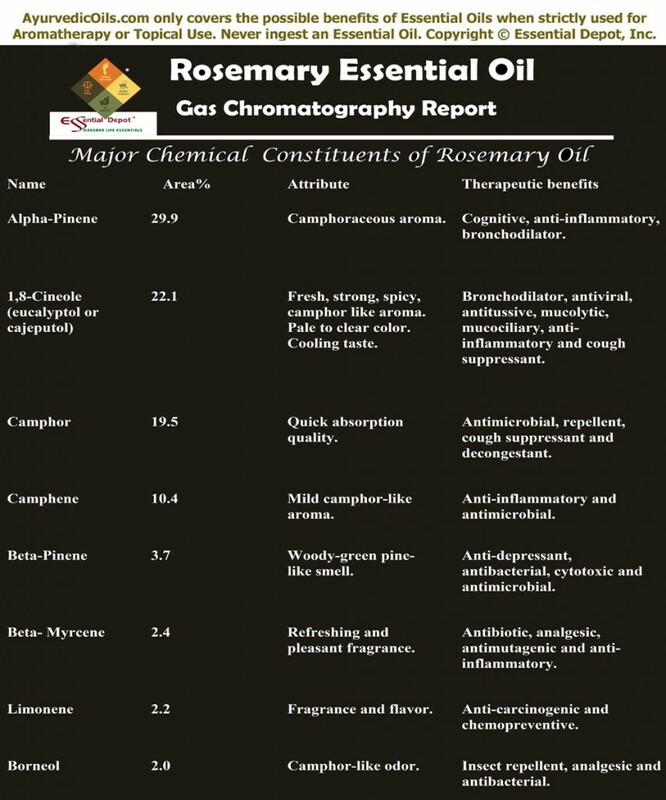 According to the Gas chromatography report, Rosemary oil constitutes of 8 major chemical components that contribute to its unique fragrance, therapeutic properties and quality. For learning more about the exclusive information of these chief constituents of Rosemary oil. Known as Rusmari, Ayurvedic medicine celebrates Rosemary essential oil as one of the standard inhalations for treating respiratory disorders, sinusitis and gall bladder problems. Rosemary is one among those few essential oils that must be in everyone’s medicine cabinet according to the trusted Ayurvedic book, Ayurveda and Aromatherapy. 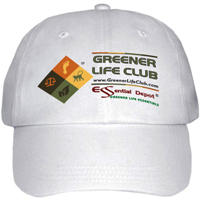 Ayurveda adores nature’s innate beauty and trusts human beings to be a vital part of nature. The simplicity of this mythological science lies in its easily understandable classification of the 3 energy elements known as doshas (vata, pitta and kapha) that construct a human’s physical and mental set-up. The imbalance of any one of these doshas is said to cause illnesses indicating that the body is out of poise with nature. Ayurveda categorizes Rosemary essential oil as a rich herbaceous oil with drying and heating energies and can effectively reduce excess vata and kapha while treating pitta deficiency. Rosemary essential oil is an excellent tonic, stimulant, calmative and relaxant. It is known to ease stress, enhance blood circulation, nourish and cleanse the scalp, stimulate hair follicles and promote hair growth naturally. Regular massaging of the scalp with 2 to 3 drops of Rosemary essential oil blended with Almond oil can help in strengthening the roots, reduce premature graying, control loss of hair and lessen dandruff. Rosemary oil is also a trusted moisturizer that foster scalp health while treating flaky and dry scalp. When used in combination with Sage oil, this oil is said to control the build-up of excess oil. For all these special factors, Rosemary essential oil is used in plenty of shampoos, conditioners and other hair care formulas. The essential of Rosemary is a brilliant energizer for treating skin problems and its brilliance lies in its effectiveness of controlling the excessive production of sebum, which is responsible for acne, pimples and black heads. 2 drops of Rosemary essential oil added with 3 drops of Orange essential oil have been proved effective in treating cellulite, the most annoying skin problem especially in post-pubertal females. This oil is known to relieve swelling, congestion and puffiness. Used as massage oil or bath oil, Rosemary essential oil can aid in the treatment of eczema, acne, stretch marks, skin eruptions, scars, wrinkles and dermatitis. Numerous studies have witnessed the efficacy of the influencing aroma of Rosemary herb and its essential oil in enhancing memory skills. Northumbria University’s psychology researchers have demonstrated their findings stating that memory impairments that affect day to day living and acts as a cause of concern for prospective memory can be handled easily with Rosemary herb. A 2003 research on ‘Aromas of rosemary and lavender essential oils differentially affect cognition and mood in healthy adults’ published in PubMed proved that the olfactory properties of the essential oil of Rosemary created a notable improvement of performance for overall memory quality and other secondary factors of memory. This study also demonstrated that “these essential oils can produce objective effects on cognitive performance, as well as subjective effects on mood”. Adding 2 to 3 drops of Rosemary essential oil to burners, vaporizers, diffusers or to your handkerchief can aid in stimulating the functions of the brain, encouraging clarity of thought, enhancing memory power, granting mental awareness and strengthening the central nervous system. You can also go for a quick meditation of just 5 minutes every morning with the intense aroma of Rosemary essential oil around you to calm your mind, enliven your spiritual power and free your mind from all kinds of mental qualms. Next time when you prepare for your examination, add 2 drops of Rosemary essential oil to any of the above mentioned things and 2 drops to your handkerchief on the day of your examination. It is said that the invigorating aroma of Rosemary essential oil helps in remembering all that you’ve studied with encompassing your atmosphere with the same fragrance. Rosemary essential oil is not only known to boost the brain power but is also recognized for instilling positive feelings. The stimulating and anti-depressant properties of this oil checks stress related disorders, nervous exhaustion, depression, fear, fatigue and anxiety. When added to your warm bathing water, Rosemary oil acts as a classic relaxant and treats physical weariness, wards off lethargic attitude, backs up mood fluctuations and help increase productivity. Bryan Miller and Light Miller in their book ‘Ayurveda and Aromatherapy’ say that Rosemary essential oil is a must-have essential oil in everyone’s medicine cabinet. With remarkable therapeutic properties like analgesic, nervine, carminative, cephalic, cardiac, emmenagogue, diuretic, hypertensive, stimulant, tonic, rubefacient, astringent, cholagogue and antidepressant, Rosemary essential oil can heal a number of illnesses including dental problems, respiratory disorders, pain, inflammation, urinary problems, gastrointestinal troubles and weak immune system. 2 drops of Rosemary essential oil added to a warm cup of water as a gargle can help you keep away from bad breath, plaque, weak gums and other oral problems. This is due to the antimicrobial activity of this oil that fights against Gram-positive bacteria, Gram-negative bacteria, fungi and other micro organisms. Adding 2 to 3 drops of this oil in vapor therapy or in warm bath can assist you in treating sinusitis, headaches, migraine pain, cough, bronchitis, mucus congestion and common cold. Blending few drops of Rosemary essential oil with soothing carrier oils like Sesame oil or Coconut oil can support in dealing with rheumatic pain, arthritis, muscular spasms, menstrual cramps, back pain, constipation and stiff neck. Massaging with this reviving essential oil promotes blood circulation, treats blocked menstruation, boosts immune power and supports overall health condition. This information is only for your reference and is not meant to substitute any prescription drugs or consultation of your healthcare professional. Consult your Ayurvedic practitioner for expert advice based on your specific health conditions and individual constitution. Avoid using essential oils directly on your skin and taking it internally. Keep away from children and is not suitable for pregnant women and people with high blood pressure and epilepsy. 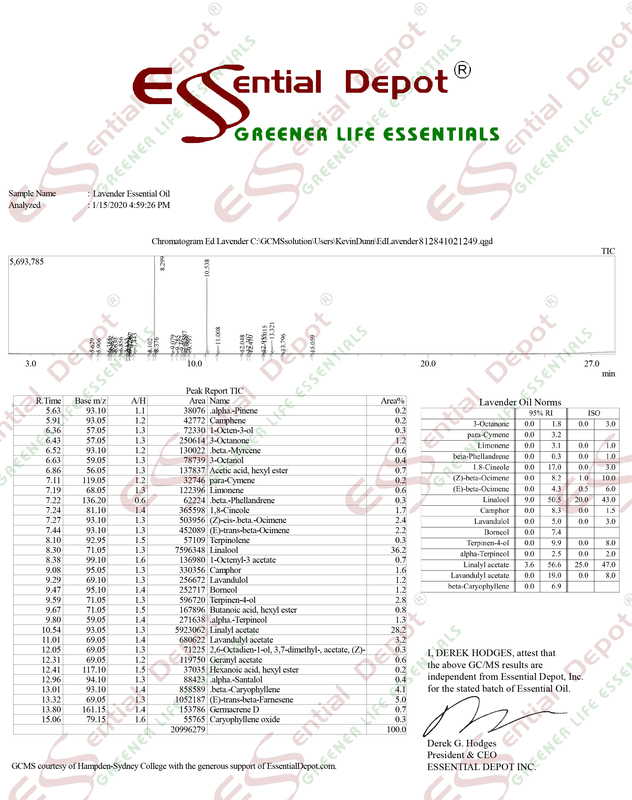 The MSDS (Material Safety Data Sheet) of Rosemary oil is readily available for your enhanced safety and better usage. “There’s rosemary, that’s for remembrance: pray, love, remember” – An excerpt from Hamlet by Shakespeare.